Knowledge of the 'spec' makes all the difference. The DVD Forum, headquartered in Japan, is an association composed of hundreds of manufacturers from around the world. These companies, in voluntary association and working under the umbrella of the "DVD Forum", created the standard definition and HD DVD "DVD Specifications", and dispense the licenses that are required to use the "DVD Book knowledge" in product development. 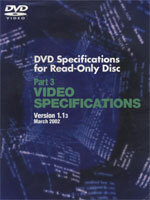 The DVD specifications consist of written volumes of detailed rules and parameters covering every aspect DVD authoring systems, Disc Images, DVD players, decoders, encoders, etc., need to follow as a standard to allow for basic compatibility. Access to these specifications, one of the benefits of being licensed, is essential to competently interpret verification reports. For instance, the MEI DVD Verifier returns in it's warnings and errors the DVD Specification volume and page number that refer to them. Up until now, the "West Coast" testing services are not licensed by the DVD Forum, do not verify the DVD's spec compliance, and rely exclusively upon running discs through large banks of players. This type of testing, though informative, does not identify underlying structural problems that are easily missed. Trai has studied the DVD Specifications extensively since '2000, and this knowledge has been the key to unravel a host of 'DVD mysteries' for his clients. Our DVD Forum License, along with our thoroughy 'dog-eared' Specification Volumes, are one of the crucial "tools" that enable us to better serve our clients.